Adobe has been making major changes lately to Photoshop's user interface, and Photoshop CS4 brings with it the most streamlined, efficient and user-friendly interface we've seen yet. In this Photoshop Basics tutorial, we'll take a quick, general tour of the new interface to see what's what, what's new and where it all is in this latest and greatest version of the world's most popular image editor! If you've upgraded to Photoshop CS4 from a previous version, you'll find that even though the overall appearance of the interface may seem quite a bit different from older versions (especially if you've upgraded from Photoshop CS2 or earlier), everything is pretty much where you'd expect to find it in Photoshop CS4, and considering how massive Photoshop has become over the years, it's a definite nod to the talents of Adobe's designers that they've managed to keep the interface so clean and elegant. The new user interface in Photoshop CS4. The Menu Bar in Photoshop CS4 (Extended). We won't bother going through all the menu options here since we'd both die of boredom and most of the important options and commands are covered in our other tutorials. As I mentioned, I'm using the Mac version of Photoshop CS4. The Photoshop menu option on the far left, which is where we find Photoshop's Preferences on the Mac, is not found in the Windows version. You'll find the Preferences under the Edit menu in Windows. Also, the Analysis and 3D menu headings are exclusive to the Extended version of Photoshop CS4 and not found in the Standard version. The Tools panel in Photoshop CS4. Again, there's a couple of tools shown here that are exclusive to the Extended version of Photoshop CS4 (the 3D Rotate and 3D Orbit tools directly above the Hand Tool), but the majority of the tools are available in both the Standard and Extended versions and most have been around in Photoshop since forever. You can switch between a single or double column layout in Photoshop CS4. Click and hold on some tools in the Tools panel to access additional tools behind it. Click and hold on the other tools in the Tools panel to see all of the tools available to us in Photoshop CS4. Directly related to the Tools panel is the Options Bar at the top of the screen. On a Windows system, the Options Bar is located below the Menu Bar. On a Mac, it's located below the Application Bar which is new to Photoshop CS4. We'll look at the Application Bar in a moment. The Options Bar displays options for the currently selected tool. The Options Bar now displaying options for the Crop Tool. The Options Bar now displaying options for the Type Tool. Every tool has its own set of options which will always be available in the Options Bar. The new Application Bar in Photoshop CS4. 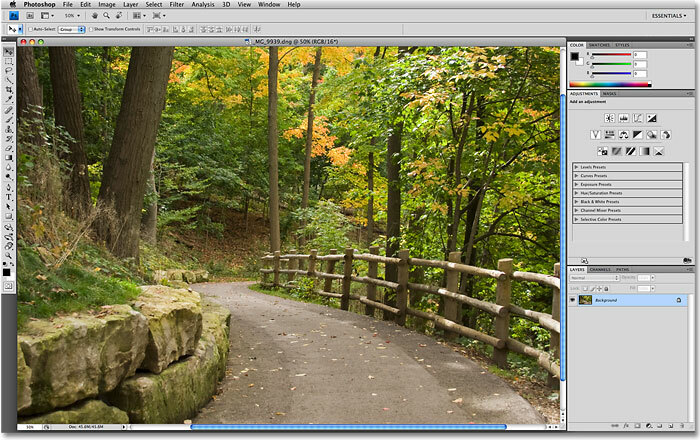 We can launch Adobe Bridge directly from the new Application Bar in Photoshop CS4. To the right of that is the View Extras icon, giving us easy access to Photoshop's Guides, Grid and Rulers. Use the View Extras icon to quickly turn the Guides, Grid or Rulers on or off. The Zoom Level icon gives us four preset zoom levels to choose from, or type your own into the input box. Both the Hand Tool and Zoom Tool from the Tools panel are now available in the Application Bar. The new Rotate View Tool allows us to rotate our view of the image without actually rotating the image itself. Photoshop CS4 gives us many ways to view multiple documents at once. 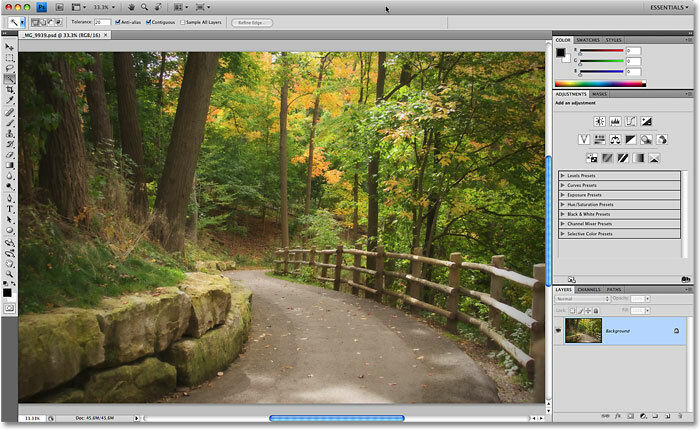 You can quickly switch between screen modes directly from the Application Bar in Photoshop CS4. The Adjustments Panel is new to Photoshop CS4. All of Photoshop CS4's panels can be accessed from the WIndow menu. Click on a panel's name tab to select it inside the panel group. Click on a panel's menu icon to view a list of related options and commands. We'll look at all the different ways we can arrange and organize Photoshop CS4's panels in another tutorial. Click on the word "Essentials" in the top right corner of the screen to view all the available workspaces. Each image appears inside its own document window. The top of the document window gives us information about the image. Much more information about the image is available at the bottom of the document window. The last feature we need to look at in our tour of Photoshop CS4's user interface is brand new and exclusive to the Mac version of Photoshop CS4, the Application Frame. Before Windows users start feeling left out and abandoned by Adobe, what the Application Frame essentially does is give Mac users the Windows experience (all jokes about random system crashes aside). The Application Frame places the entire Photoshop interface inside a self-contained application window, which is how it already works in Windows and why this feature is only available in the Mac version. 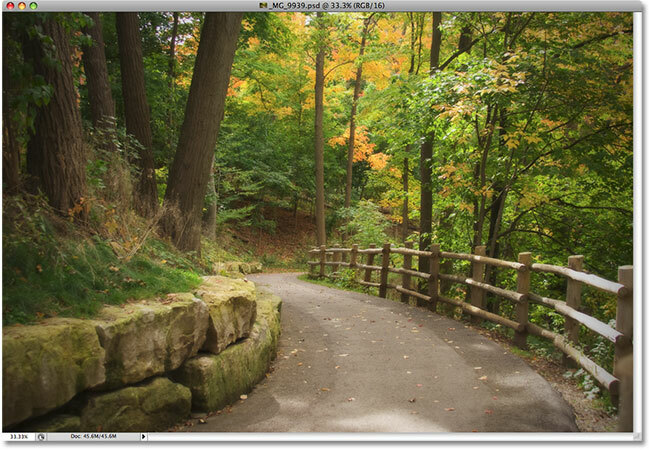 Go to Window > Application Frame to place Photoshop inside an independent window (Mac version only). The Application Frame places all of Photoshop CS4's interface elements inside a self contained, draggable window. You can resize the Application Frame by simply moving your mouse cursor to the edges or corners of the frame, then clicking and dragging to resize it. To exit out of it and return to the Mac's default view, go back up to the Window menu and choose Application Frame once again to deselect it. And there we have it! That's our quick tour of the streamlined, redesigned user interface in Photoshop CS4! Visit our Photoshop Basics section to learn more about the basics of Photoshop! All of our Photoshop tutorials are now available to download as PDFs!